Hors d’oeuvres are being served in the private Gallery Room, up the winding, carpet-lined stairs at the tony 21 Club in midtown Manhattan. It’s 7 p.m. on a balmy summer evening and cocktail hour has just begun. Trays of grilled chicken, Caprese salad and Swedish meatballs are proffered by genteel men in immaculate black suits, red wine and whiskey handed out from behind a wood-paneled bar. Chandeliers dangle overhead. The dress code is formal. The mood, hopeful. This is stop No. 1 on the Atlanta Falcons Image Rehabilitation tour, where two dozen media members were invited to attend what was billed as an “intimate, on-the-record chat” with team officials about the franchise’s direction and the grand opening of its much-hyped new stadium. Few NFL teams have ever felt the need to gather reporters in the offseason, feed them, booze them, schmooze them, and let them know that all is going great. But then again, no team has ever experienced the collapse, the national embarrassment, that the Falcons did in Houston last February. Especially not at such a critical juncture in franchise history, when everything really was going great, better than ever before. Until it wasn’t. In 2016, the Falcons—a franchise that had long settled into its middling position in the NFL hierarchy, right in the meaty part of the curve—seemed ready to ascend to new heights. They were on the precipice of gaining entry into an exclusive club, one of enduring excellence and sustained prominence, the top tier of NFL franchises. Then, 28-3 happened, and everything came crashing down, the collapse of a Jenga tower only with the whole world watching. And now here we are, upstairs at the 21 Club, fancy finger food being passed around and the franchise attempting to make it very clear that the tower did not actually collapse, not fully at least, that the foundation that they built their resurgence upon is still in tact and that they plan to continue to build on top of it, 28-3 be damned. Team owner Arthur Blank, president Rich McKay, chief executive officer Steve Cannon, general manager Thomas Dimitroff and head coach Dan Quinn circumnavigate the Gallery Room. They shake hands and offer pleasantries, thanking those present for being present. A dozen infographics, printed on poster boards and sitting on tripod stands, are scattered about. They each tout different aspects of the soon-to-be-debuted Mercedes-Benz Stadium—Construction and Design; Food and Beverage—and are filled with facts that will double as talking points throughout the evening. 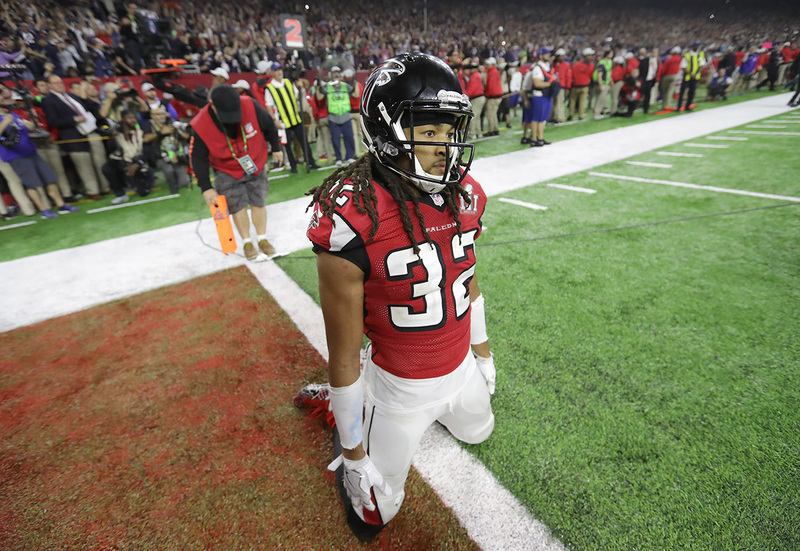 Jalen Collins, after the final play of Super Bowl LI. After half an hour of mingling, everyone is ushered to their assigned seats—the five team officials strategically spread between the four cloth-lined tables. Conversation is subtly steered towards details about the new stadium, and to be fair, the specs are impressive. Then, before dinner is served, Blank stands to give a toast. He regales the audience with a story, saying that he received an email from an old friend shortly after the Super Bowl. You must be so disappointed, the friend wrote. No, Blank responded, I’m not. JoeLandon Dixon started Sunday, January 22, the way he starts every Sunday, embarking on a 20-mile drive to mass in Albany, Ga., where he planned to take his usual seat behind the keyboard and perform his duties as the church musician. That was around noon. The NFC championship game was still four hours away, more than enough time to pray for his Falcons and make it back home for kickoff. But as Dixon began his drive, rain pelted the window of his black GMC Yukon; he strained to see the road in front of him. So he turned the truck around and went home. He had heard the weather reports earlier that day, the tornado warnings for Cook County, Lowndes County, Berrien County, Brooks County, Colquitt County, Thomas County, and Atkinson County, but figured it would be a dud, probably just a windstorm. Besides, Albany had never been hit with a tornado before. Still, on his way home he decided to buy groceries at the local harvest and a lighter for candles at Circle K, just in case the power went out. He pulled into his driveway right around 4 p.m., minutes before kickoff, and settled in front of the TV with his wife and four children. Dixon, 35, is a lifelong Falcons fan—falling for the team during the Dirty Bird years, fandom peaking in the Mike Vick era. Even as his friends constantly teased him for the Falcons’ shortcomings, calling the team “The Big Show Poopers” because of their inability to win important games, he never wavered. So of course Dixon now believed that Atlanta was going to the Super Bowl. It was their moment, he thought. Then he heard it. The tornado. It sounded like a train rumbling through the neighborhood. It only lasted about two and a half minutes. But when the storm subsided and Dixon walked out his front door, he saw a tree draped across his lawn. His truck was busted up, the rearview window smashed out. The shingles on his roof had blown off and a few of the windows in his house had been shattered. His backyard was filled with branches that stacked up to eye level. A giant black tarp, which originated from an unknown location on a different road, had been ripped in two—one part landing in his yard, the other stuck high up in a tree, hanging 50 feet in the air. A large transformer pole was felled and stretched across his back yard, next to his kids’ playhouse, which was also toppled. But when he looked around his neighborhood, he realized he had been lucky. Across the street, his neighbor had a tree slicing straight down the center of his house, dividing it evenly in two parts. Down the block, one house had its roof ripped off, leaving the top floor visible from the street. Cars were overturned. 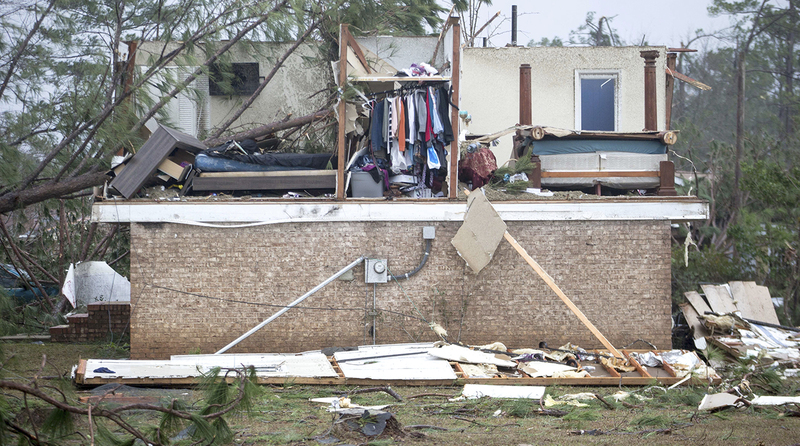 Pieces of corrugated metal, stripped from the Procter & Gamble factory over two miles away, were scattered about, hanging off trees, covering backyards, resting on the tops of houses. Where there was once a dense border of trees lining both sides of the road was now just branches and stumps. Nearby, dozens of streets were leveled completely, entire houses gone missing. Emergency workers soon arrived. They came with megaphones pressed to their lips and breathlessly announced that there was a gas leak, everyone had to evacuate immediately. People just began running. Dixon managed to shepherd his family safely to his in-laws house a couple of miles away, where he was able to follow the football game on his phone. He followed along as the Falcons completed a 44-21 demolition of the Packers. What was left of one house in Albany, Ga. after a tornado ripped through the town the day of the NFC title game last January. The tornado was classified as an EF3, with winds reaching 150 miles per hour. It traveled 70.7 miles through five Georgia counties, putting it in the top 0.3% of all tornadoes, in terms of path length, since 1950. Twenty-one people died. Dixon would spend multiple days sawing up the trees in his backyard and dragging the wood to one side of his lawn. Four days after the storm had passed, as volunteers were passing out food and water in the neighborhood, he was still cutting up the transformer pole. Super Bowl LI was just over a week away and, despite—or more accurately, because of—the destruction around him, Dixon was optimistic. “I know the Falcons are going to bring this home for us,” Dixon says. Atlanta has long been a tortured sports city, home to only one championship team in any of the major sports, the 1995 Braves. Sure, the Falcons have had brief stretches of success, most notably the ’98 squad that went 14-2 and earned the franchise its first Super Bowl berth. That team, known affectionately as the Dirty Birds, was fun and eminently likable. And then came Super Bowl week. For some reason, the Falcons decided to change the way that they exited the team plane when they arrived in Miami—the Pro Bowl players disembarked first, followed by everyone else. Receiver Terance Mathis made a comment to the media that he didn’t like the set-up, and then had to stand in front of the team on Wednesday and apologize for speaking out. During the lead up to the game against Denver, cornerback Ray Buchanan wore a dog collar to Media Day and said Broncos tight end Shannon Sharpe looked like a horse. The night before the game, safety Eugene Robinson, the Bart Starr Man of the Year, was arrested for soliciting a prostitute. The Falcons would lose, 34-19. The next year the team went 5-11, the first of three straight losing seasons. Then came Michael Vick and all of his magic. Again the Falcons enraptured the nation, becoming the favorite team for other franchise’s apostates and Madden video game players. But results on the field were mixed. And then Vick was indicted on felony dogfighting charges and sent to jail, ending that era before it really began in full. And thus, the Falcons’ reputation was born: an endearing but unexceptional franchise, one whose success would always come in brief, transient waves. “Ever since ’98, the city has been crying and hoping and praying for a champion,” says Mathis. 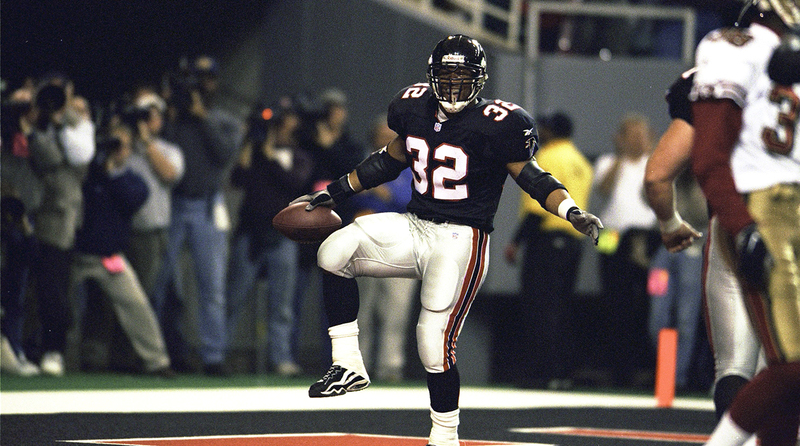 Jamal Anderson (and his end zone celebrations) captured Atlanta's imagination during the 1998 season. This decade, however, the Falcons have come close. In the nine seasons since Atlanta hired Dimitroff as general manager in 2008, and he in turn selected Matt Ryan with his first draft pick, Atlanta has had five seasons with double-digit wins. In the previous 42 years of the franchise’s existence, they had four such seasons. After years of adding talent to their roster piecemeal, it all coalesced last year. Ryan piloted the NFL’s best offense and was named league MVP, the first time a Falcons player ever received the award. The young defense was aggressive and opportunistic, growing stronger as the year went on. The team was still fun but now, at times, it was dominant—and the fans responded in kind. In 2016, the franchise connected with their city and their fan base in a way they never had been able to before, something that was clearly palpable during their thrashing of the Packers in the NFC championship. That game, the last played at the Georgia Dome, resembled a raucous block party more than anything else. Atlanta-born rappers Jermaine Dupri, Ludacris and Young Jeezy performed “Welcome to Atlanta” before kickoff, as celebrities, all Atlanta natives, dotted the sidelines and the stands, from Samuel L. Jackson to Dwight Howard to Jimmy Carter. The season coincided with a cultural renaissance for the city, with local artists exploding onto the scene. The rap group Migos had the Billboard No. 1 song in January, while actor/producer/director Donald Glover created and starred in an acclaimed TV show—Atlanta—that won multiple Golden Globe awards. The city, in many different yet connected ways, had been thrust into national prominence. John Lewis, the congressman from Georgia’s fifth district, in Atlanta, has seen the renaissance first hand. Lewis mentions how, on the day before the Falcons beat the Packers, 60,000 citizens convened downtown to march for women’s rights and social justice. That January weekend, Lewis says, showcased the city’s diversity, its rich history and its ongoing transformation. The Falcons, he notes, are an integral part of that. Lewis considers Falcons owner Arthur Blank a friend. When President Barack Obama presented Lewis with the Congressional Medal of Freedom, Blank was the only non-family member he invited to The White House. He can appreciate what Blank has built. For the last few years, every time Lewis has flown into Atlanta, he would look out the window and note the progress on the construction of the $1.5 billion Mercedes-Benz Stadium. A week before the Super Bowl, Blank reflected back on how far the franchise has come in his 15 years of ownership and what this moment meant for Atlanta. He mentioned the “Brotherhood” mantra that Quinn created, and how that has expanded far beyond just the team, how it resonated with the entire city. He mentioned how, when the Falcons bus departed for the airport, headed to Houston for the Super Bowl, 20,000 fans lined the streets to send them off. Five months after the game, back in the Gallery Room, more wine is being poured. Caesar salad, salmon and steak are served, followed by chocolate tart and cheesecake. After dessert is finished, a projector screen comes down from the ceiling and a seven-minute video on the opening of Mercedes-Benz Stadium begins, unspooling like a dramatic movie trailer for an upcoming blockbuster. The video details all the specifics of the new stadium experience. The 360-degree “halo” video board—which is six stories tall and 1,100 linear feet, longer than the Eiffel Tower is tall—and the seven-story-tall high definition “mega column,” both the first of their kind. The 2,000 televisions, 4,000 solar panel and 4,000 miles of fiberoptic cable to provide “unlimited bandwidth.” The “fan-first” pricing on food, including $2 hot dogs and popcorn, $3 waffle fries and pizza, and $5 beer. The 1,264 beer taps. The world's largest bird statue out front, more than 41 feet tall and over 36 tons. It is as if the Falcons created an adult Disney World, in which football will also be played. The video ends and the five Falcons representatives field questions. Blank tells the story of how, when he bought the Falcons in 2001 for $545 million, he met with Paul Tagliabue. The commissioner told the neophyte owner that Atlanta was the 46th most viable city to be home to NFL franchise and warned him of the tough road ahead. So Blank decided to sell season tickets for $100, and 20,000 seats were gone in half an hour. He says that Tagliabue got frantic calls from owners then wondering, What is this nutcase doing? He imagines that—because of his bargain-bin pricing on food and his intransigent refusal to cut costs in any aspect of the stadium-building process—Roger Goodell might field the same calls today. “I am willing to bet on Atlanta,” Blank says. The following day, team president Rich McKay swings by the Sports Illustrated offices. He’s still selling the franchise, still peddling optimism. Wearing his NFC championship ring, he settles into a chair. He says that this time, they don't want to let this moment be fleeting—the memory of the 1998 Dirty Birds still lingering over the franchise like a pall. He notes that while about 25% of a team’s roster is overturned every year, making it a constant rebuilding experience, it is not the same with the fan base. 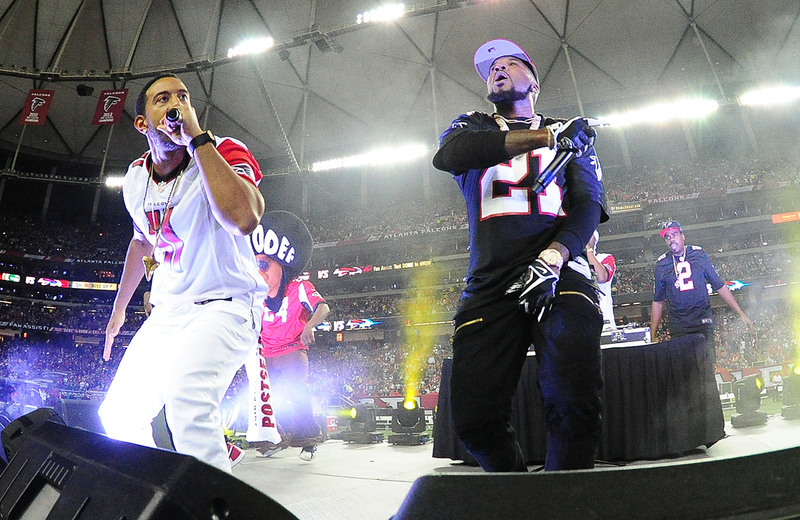 Young Jeezy (right) and Ludacris opened the final game at the Georgia Dome with "Welcome to Atlanta." He talks about the new stadium and about how it helps to further that connection. But, he says, its impact will be bigger than that. “It will take Atlanta to another level,” he says. Last year, McKay notes, Atlanta was third in the country in terms of visitors, with 50 million. He predicts that almost nobody would guess the city would even be in the top 10. That, he says, speaks to a greater feeling of marginalization and disrespect that permeates that city. But McKay knows that, unlike other franchises that have a rich history of winning, the Falcons don’t have the luxury to simply expect their fan base to stick around, a bank of equity to fall back on. They recognize that if they revert back to their losing ways this season, all that they built could be lost. He understands how hard the Super Bowl defeat was on the city and its citizens, after so much promise, so much excitement and anticipation. About six weeks after the Super Bowl, McKay was golfing at the East Lake Golf Club in Atlanta and his caddy, a lifelong Falcons fan, shared with him a story. The caddy said that at the end of the Super Bowl, he had to send his kids out of the living room because he was so devastated. He didn't want them to see him; it was that unbearable. Then he told McKay something that has stuck with him. The caddy said that, a month and a half after the game, he and his wife still hadn't been able to sleep. He said that the collapse was the hardest thing they had ever gone through in their lives. About six months after the tornado hit, JoeLandon Dixon and his neighbors are still picking up the pieces. His roof has been replaced, and the windows on his house and his car fixed. But detritus remains on the streets, scattered pieces of metal siding or asphalt shingles magically reappear each week. The debris lingers, serving as an enduring reminder of the storm; just when everything seems normal again, there’s a shard of glass on the sidewalk, a chunk of tarp in the tree. But Dixon, his wife, his 18-year-old daughter, 16-year-old son, 10-year-old daughter and 9-year-old son sat around their TV, with chicken wings, chips, dip and soda, to watch their Falcons. Before the game everyone in the room was confident, maybe too confident. They felt like there was no way they were going to lose. When the Falcons burst out to a 28-3 lead in the third quarter, Dixon’s 16-year-old son, Jakori, was running around and screaming. We’re going to win, can’t nothing stop us. But Dixon was hesitant, something didn't feel right. As the Patriots embarked on their comeback, the cheers in the living room turned into pleas. What are you guys doingggg! Come onnnnn! What are you thinkingggg! And then, when the Falcons lost on the first drive of overtime, the pleas turned into silence. It’s not all bad, though, Dixon says. He means that about both his Falcons in the wake of their devastation and his neighborhood in the wake of its destruction. Dixon notes how in the months after the tornado hit, his town came together in a way he had never before seen. Neighbors would go door to door, asking if there was anything anyone needed. People would help strangers clean their house, patch their roof, offer the name of an adept handymen they had hired. Last week, Atlanta began the 2017 season in inauspicious fashion. They eked out a close win on the road against the Bears, a last second defensive stand securing the victory. They will now open Mercedes-Benz Stadium on Sunday night against the Packers, a rematch of that final game at the Georgia Dome. Two of the best teams in the NFC facing off in a primetime game. Surely, the country will be watching closely. 28-3 memes will surely be tweeted out, jokes will surely be told at the Falcons’ expense. 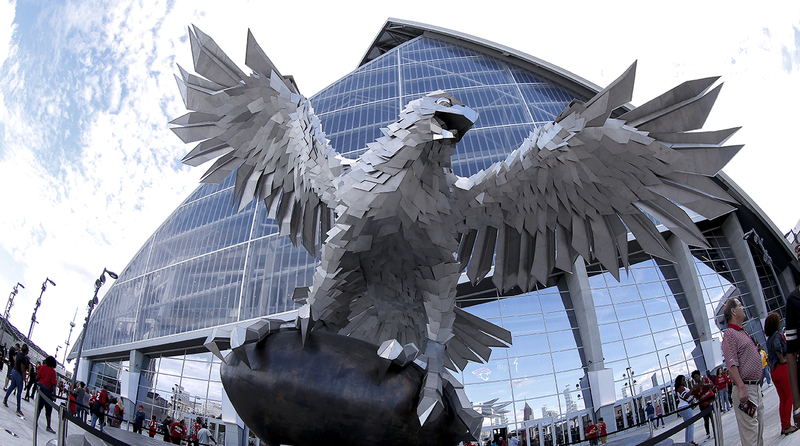 But the 41-foot-tall bird statue will now be glistening out front. The 1,100-foot-long video board, seven-story-tall ‘mega column’ and 2,000 TVs will be turned on. Without a doubt, their new home will impress. But that won’t be enough. Not this time. On Sunday night, the Falcons hope to not only open a new stadium, but usher in a new era. The opportunity is there. It just depends on what they make of it.